Kallie Brynn Blog: Print Shop Sale! Now that you have some Christmas money in your pocket from Aunt Betty, why not buy some prints for your home or as gifts for upcoming events and birthdays? Add some beautiful flowers to your wall that will never wilt and have daydreams about traveling to France, Thailand, and the Pacific Northwest. 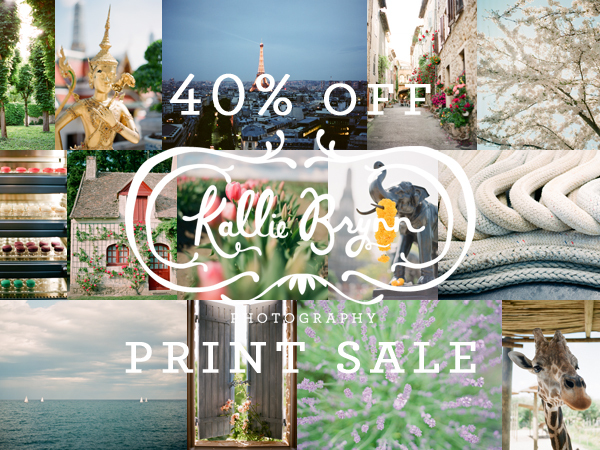 All prints are now 40% off in the Kallie Brynn Photography Print Shop! Prices as marked. Sale ends January 31st, so hurry!